1 on 0 Headman is an AWESOME drill. Give it a try!! 1. On the whistle, (1) passes a puck to the (D). 2. D to D pass, then a return pass to (1). 3. (1) receives the puck and makes a stretch pass to the “Ghost Man” (Gh), who has skated across the neutral zone. 4. (Gh) takes a shot. 5. (2) passes a puck to the (D). 7. (2) hits (1), who has turned back up the ice. 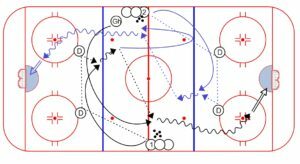 The drill is continuous with (1) making the next pass to the (D) and the stretch pass to (2).